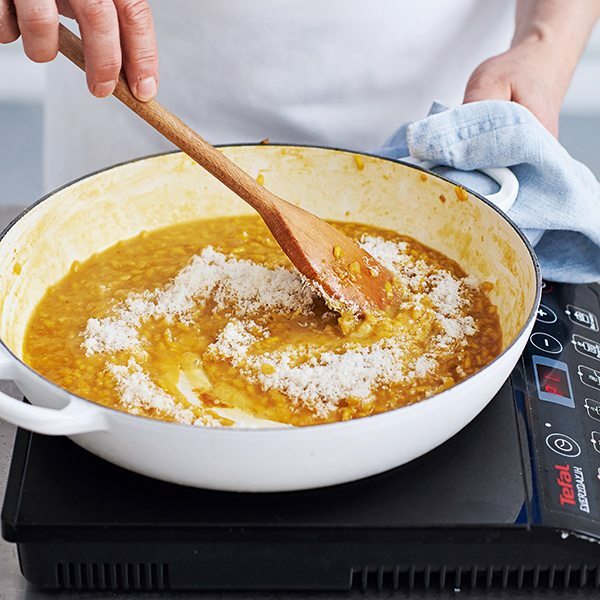 Learn how to make this decadent Italian dish with our step-by-step guide to melt-in-your-mouth meat, silky risotto and a lemon gremolata. This recipe serves 4. Hands-on time 1 hour 20 min, oven/simmering time 3 hours. 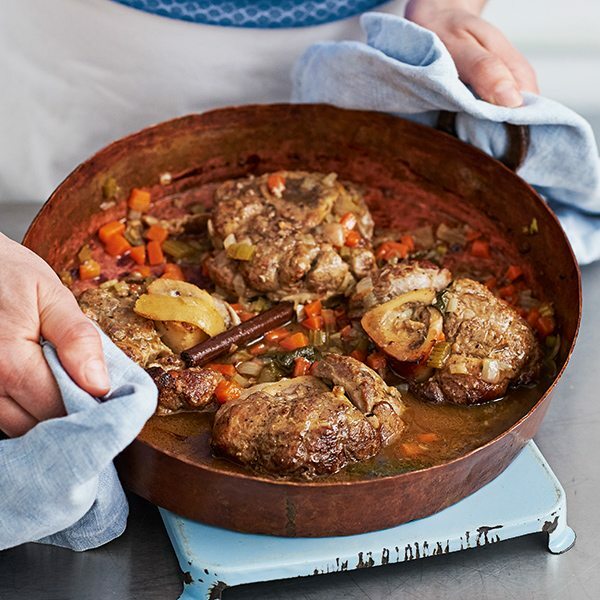 Cook the osso buco up to 3 days in advance; keep covered in the fridge. Reheat in the oven until piping hot and scatter over gremolata to serve. Or freeze for up to 3 months in a sealed container. Partially prepare the risotto (up to the end of step 6) up to 20 minutes in advance. 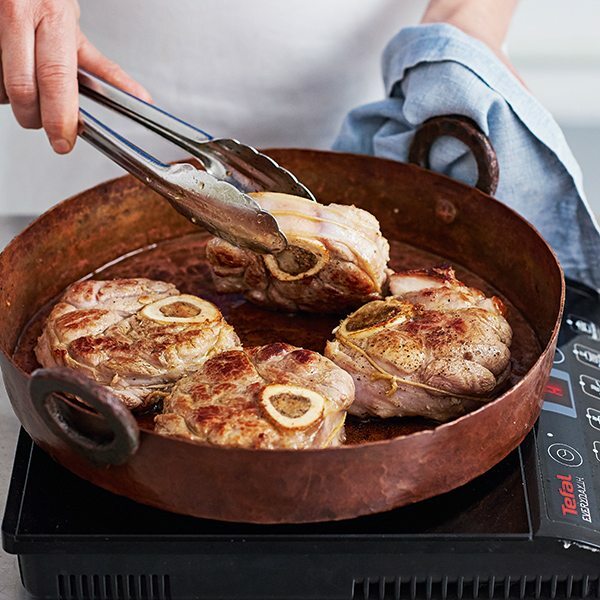 Ask your butcher to saw the osso buco into ‘double-cut’ (double thickness) slices, at least 5cm thick. 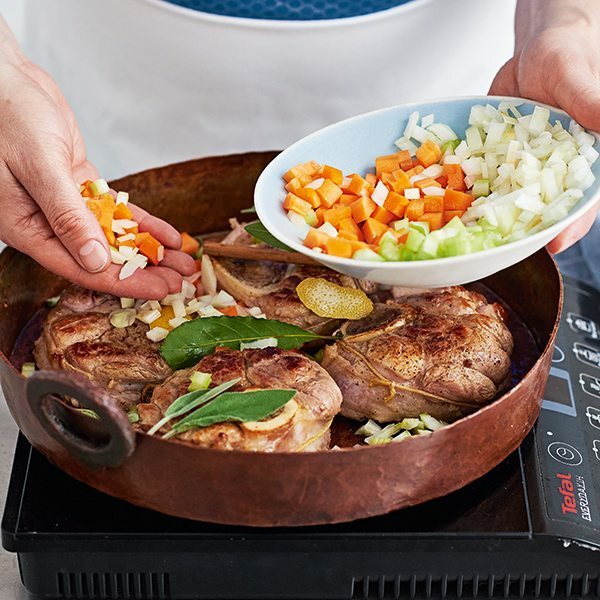 If you can’t get hold of osso buco, the closest you can get to the flavour would be to use chicken legs or quail. You could use beef shin, pork shin or lamb shank if you prefer, but veal is the most authentic. For the risotto you can use arborio rice in place of carnaroli. Toasting the rice first (step 5) isn’t essential, although it does impart a lovely nutty flavour. 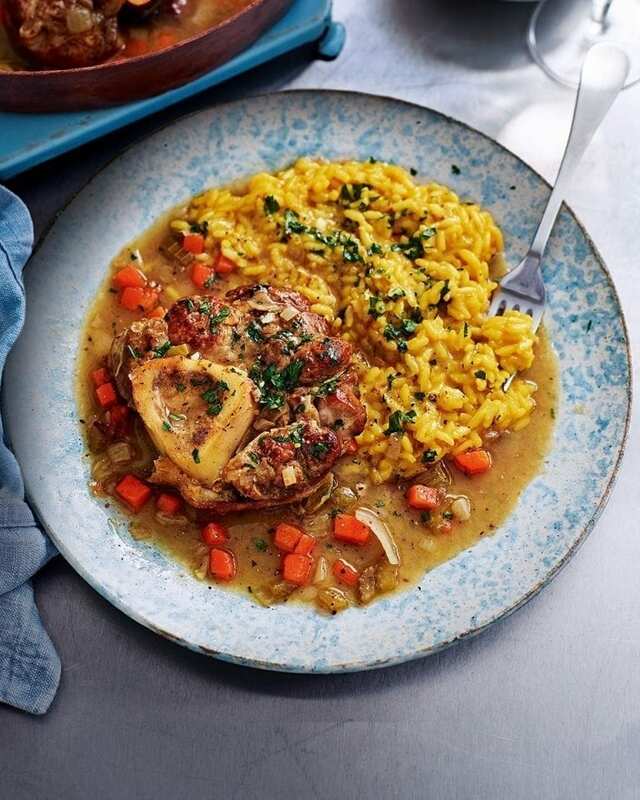 This dish is perfect for entertaining as the osso buco and risotto can be cooked or prepared in advance. 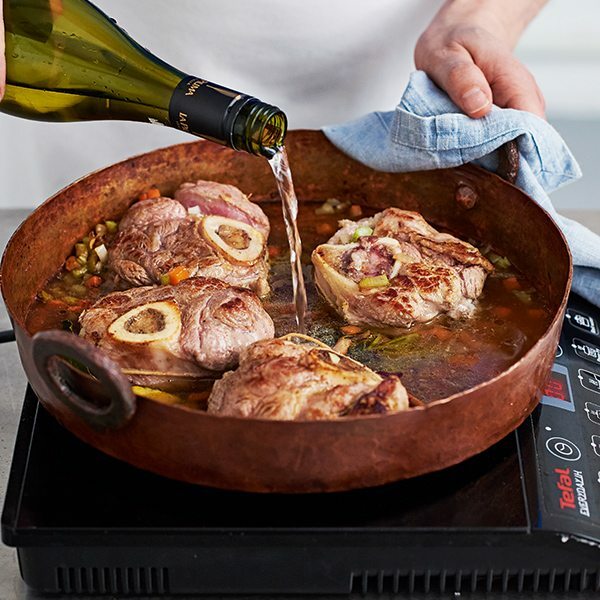 1 Season the osso buco well with salt and pepper. 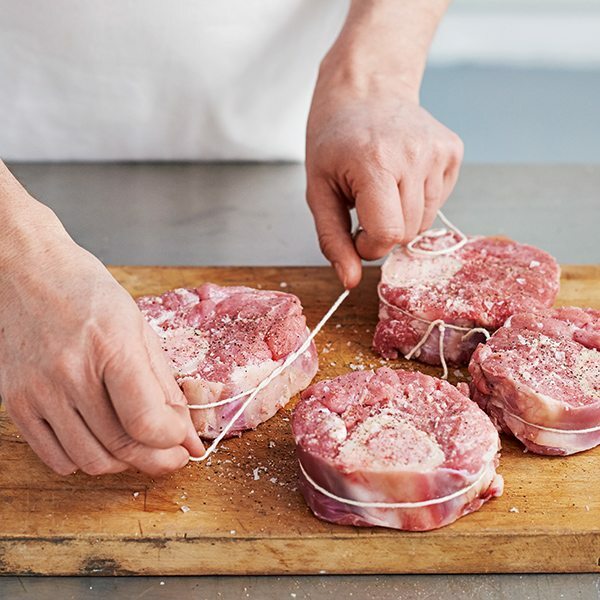 Cut pieces of string long enough to tie around each piece of meat (thick osso buco slices are easier to tie than thinner ones). Tie firmly into rounds to help them keep their shape as they cook, then sprinkle the flour all over. 2 Use a deep, lidded frying pan that‘s large enough to fit the meat snugly in a single layer. Heat the pan with a little of the olive oil over a medium heat, then add the meat and brown all over; proper browning takes at least 20-30 minutes. If the meat isn’t browning, add the butter, which will help it to caramelise; give it a further minute on each side after adding the butter. 3 Add all the remaining osso buco ingredients, except the wine. Nestle the veg under the meat, then cook on a low heat for 15-20 minutes. 4 Heat the oven to 160°C/140°C fan/gas 3. Add the wine, and some water if necessary, to the pan to come two-thirds of the way up the meat. Set the lid ajar on top of the pan, then cook in the oven for 3 hours or until the meat is tender and starting to fall apart. (Alternatively, simmer on the lowest heat on the hob.) Check occasionally, adding more water if necessary. At the end, taste it to make sure it has enough salt. 5 Meanwhile, to make the risotto, toast the rice in a dry medium pan over a high heat for 4-5 minutes or until it smells strongly of rice, but not so much as to give it any colour. Transfer to a bowl and set aside. Reduce the heat under the pan to low, then add the onion, garlic and half the butter. Add a good pinch of salt and cook gently for 20 minutes or until the onion is translucent. 6 Add the saffron strands, then return the toasted rice to the pan and stir to coat in the buttery onions. Increase the heat to medium, then add the wine and simmer until the liquid has been completely absorbed. 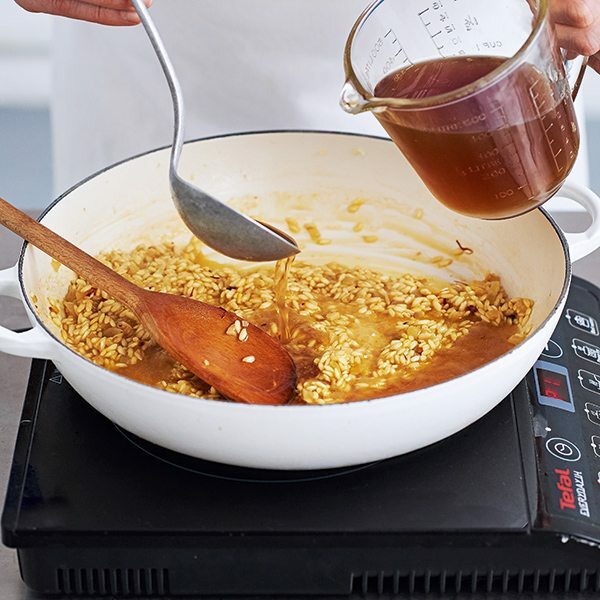 7 Bit by bit, add the stock; wait until the stock has been absorbed before adding more, cooking and stirring until the rice is al dente and the sauce thickened. Be prepared to add a little more or less stock, depending on the heat and size of the pan. You’re looking for al dente grains of rice (firm and defined but not crunchy) in a smooth sauce. Taste for seasoning as you go; the rice will soak up salt like a sponge. 8 When the rice needs just a few minutes more cooking, add the bone marrow, if using. 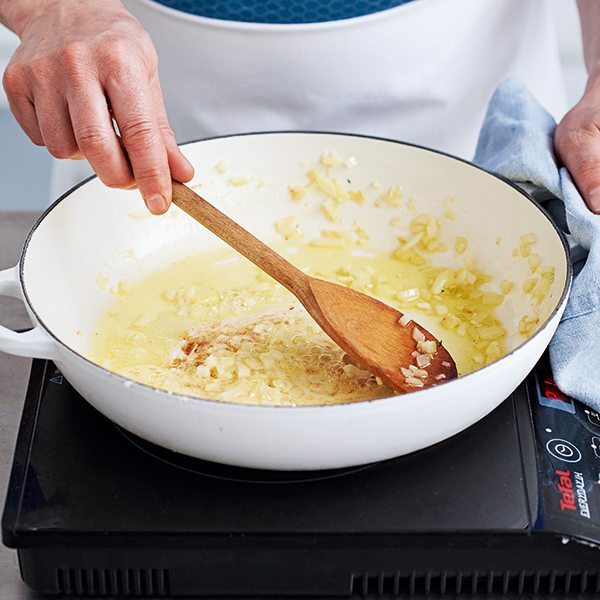 Vigorously stir in the parmesan and remaining butter to give a velvety texture. This is called mantecare in Italian and literally means ‘to make creamy’. Taste for seasoning one last time. If you’re not happy with the texture, there’s still hope. If it’s too runny, turn up the heat to boil off the excess liquid; if it’s too thick, add a splash of water or stock to thin. 9 Increase the heat towards the end of the osso buco cooking time to thicken the sauce. Remove and discard the string from the osso buco. Combine all the gremolata ingredients in a small bowl, scatter over the osso buco, then serve with the saffron risotto.